The owner of a gun range has agreed to temporarily halt firearms shooting at his quarry across the Willamette River that has resulted in bullets traveling into west Keizer. Through attorneys, Lance Davis, owner of River Bend Sand & Gravel, also agreed to give 10 days notice before resuming shooting range activities, but that isn’t good enough for Tom Bauer, whose wife was narrowly missed when a bullet penetrated the walls of his home and came to rest in his kitchen on June 2. Nearly two dozen Keizer residents made the journey to Dallas, and a handful provided testimony to the commissioners and requested action. Prior to the Board of Commissioners meeting, a group of more than 50 west Keizer residents met in Sunset Park on Thursday, July 5, to discuss their strategy moving forward. Citing several past incidents of bullets being recovered on the east side of the river, Keizerite Shirley DeShon told commissioners that fears are on the rise. “When they start shooting, everyone runs in the house like it’s a war zone. I’ve had it and we’re all done with this stuff. There was no action until Tom’s wife was almost hit,” DeShon said. Keizer residents also took issue with an assessment from Polk County Sheriff Mark Garton that shooting can be done safely on the site with proper precautions and safety measures. “There is no safe direction to shoot over there. Most guns shoot at least one mile and average about two miles,” said Rhonda Rich. It’s estimated that the bullet that hit the Bauer residence flew about 3,300 feet. William George, who once found a bullet between his home and his neighbors’ said that the problem with the quarry shooting range is that it gives the perception of isolation when it’s not. “You’ve got to be safe and there is no way a cottonwood is going to stop those bullets,” George said. Shelly Griffin said she and her husband didn’t report an incident that sent her husband and a friend commando crawling back to their home around 2010. “We had the attitude that nobody cares because it’s been going on for years. It doesn’t have to happen, and it’s not the appropriate place. I encourage you to come over and see how close the range is in proximity to people,” Griffin said. Keizer City Attorney Shannon Johnson requested that Polk County commissioners hold off on taking action until Keizer makes a formal statement, but Commissioner Mike Ainsworth offered vocal support of Keizerites’ pleas repeatedly throughout the meeting. “This has irritated me from the beginning. I’m not opposed to people shooting guns, but there has to be some common sense,” Ainsworth said. Commissioner Craig Pope was more reserved in his assessment and wanted to deploy the right solution. Polk County District Attorney Aaron Felton told members of the Polk County Board of Commissioners and nearly two dozen Keizer neighbors that he wished he had known sooner about gun range activities taking place in his jurisdiction that put lives at risk. Felton said he first became aware of the hazards created by a quarry being used as a shooting range when four men were cited for reckless endangering in June after a bullet fired from the quarry penetrated a Keizer home and only stopped when it hit a granite kitchen backsplash. The quarry is located across the Willamette River from Keizer but two incidents in the past year have ignited fears in area residents. The first was in September 2017 when a hail of bullets strafed through trees in Sunset Park along the river, the second was the June incident. Felton’s office dismissed the charges against the four men allegedly using the shooting range at the time of the June incident and was taken to task for the decision by Keizer residents and Commissioner Mike Ainsworth of the Polk County Board of Commissioners for letting the suspects off the hook. Felton said the standard for prosecuting the men in connection with the incident was higher than the one sheriff’s deputies needed for issuing the citations. Police officers need probable cause to issue a citation, but attorneys need to prove the facts of a case beyond a reasonable doubt to convict someone of a crime. Felton said that proving the case would have required the men to knowingly disregard the possibility that they were placing others in danger. “There was physical barriers, vegetation and berms. Given the facts, we couldn’t prove they knew the homes were on the other side,” Felton said. 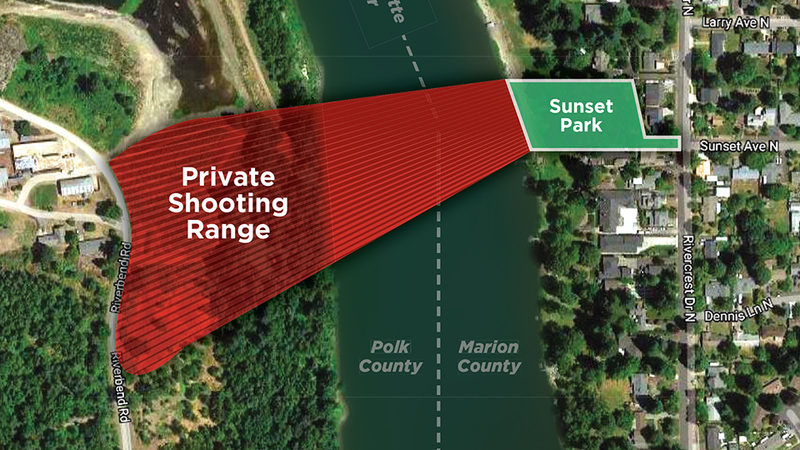 A code enforcement officer for Polk County has notified the owner of a quarry across the Willamette River that he must apply for a conditional permit or stop using the space as a shooting range for friends and family. The letter was addressed to Lance Davis, the owner of River Bend Sand & Gravel, where shooting has taken place for a number of years. Copies of the letter were distributed to Polk County Commissioners and attendees at a public meeting in Dallas on Tuesday, July 10. Jackson said he visited the site in response to a complaint stemming from a bullet being fired from an AR-15 that penetrated the exterior walls of a Keizer home and stopped two feet away from one of the residents when it hit a granite backsplash in a kitchen. Four men were ticketed for reckless endangerment, but the charges were dismissed (see related story DA laments late recognition). The property is currently zoned as exclusive farm use, which does not include shooting ranges or firearms training facilities. If the shooting range had been permitted before 1995, it might have been grandfathered in, but Jackson said a review of records found no such permit and is therefore in violation of public nuisance codes.